The average life expectancy in the U.S. was 51.5 years. In Utah this has improved to 76.5 years by 2005. Only 16 percent of the homes in the U.S. had a bathtub. Only 9 percent of the homes had a telephone. A three-minute call from Denver to New York City cost $10.50. There were only 11,000 cars in the U.S., and only 376 miles of paved roads. Motor trucks were first introduced in Utah in 1905. Alabama, Mississippi, Iowa, and Tennessee were each more heavily populated than California. Utah had a population of approximately 296,000, including 110,000 in cities, and 186,000 in rural areas. By 2005 the US Census Bureau estimated the Utah population to be 2,401,072. The average wage in the U.S. was 25 cents an hour. The average U.S. worker made between $300 and $450 per year. A competent accountant could expect to earn $2,200 per year, a dentist $2,700 per year, a veterinarian between $1,700 and $4,000 per year, and a mechanical engineer about $5,500 per year. More than 92 percent of all births in the U.S. took place at home. Instead, physicians apprenticed with practitioners, then attended medical schools, many of which were condemned in the press and by the government as "substandard." Sugar cost five cents a pound. Eggs were sixteen cents a dozen. Canada had recently passed a law prohibiting poor people from entering the country for any reason. 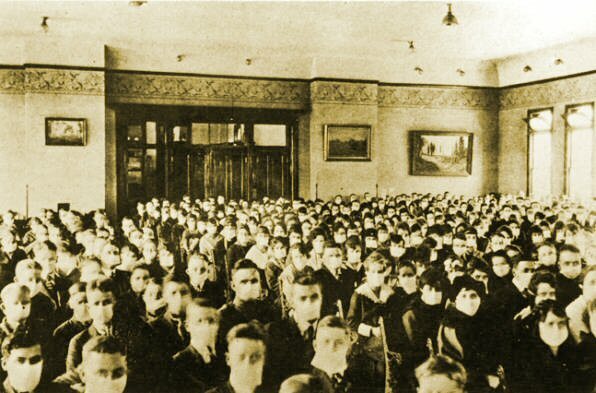 Still to come: At this assembly in College Hall, all of the students wore hygienic masks as a precaution against the virulent influenza, which broke out in a massive epidemic in 1917 and 1918. The school was forced to close for three months, October through December 1918. Hundreds died in Utah County, and some families were entirely wiped out. In Utah, death rates from infectious diseases increased from 155.4 per 100,000 people to a peak of 236.7 per 100,000 in the influenza pandemic of 1917 and 1918, then decreased to 7.3 per 100,000 in 2005. Infant mortality rates increased to 71.4 per 100,000 live births in 1920, to a record low of 4.8 in 2005. Utah's star was the 45th. 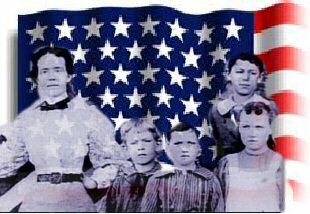 Following Utah's statehood in 1896, the 1905 American flag had 45 stars. Arizona, Oklahoma, New Mexico, Hawaii, and Alaska hadn't been admitted to the Union yet. Oklahoma would come next in 1907. The population of Las Vegas, Nevada, was 37. Conditions in Nevada were so depressed that the Chicago Tribune urged Congress to end Nevada's statehood. In 1905 the Utah Bureau of Vital Records and Statistics began to file birth certificates for persons born in Utah. From 1905 to 2005, Utah Vital Records has documented 2.5 million births and 640,000 deaths in Utah. Crossword puzzles and canned drinks had not been invented yet. 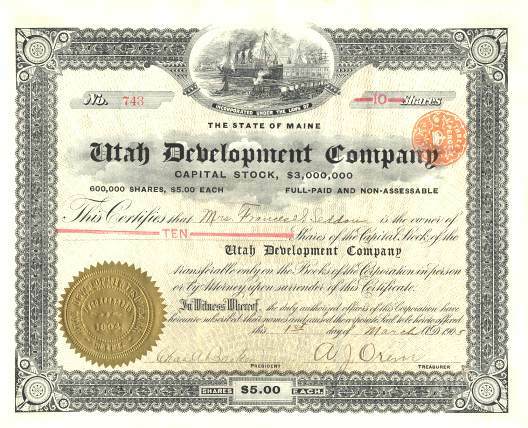 The Utah Development Company, started in 1905 with $3 million, issued this 1905 certificate signed by its president, Mr. Chas. A. Baker, and treasurer, A. J. Orem, a railroad builder. A few years later, A. J. Orem formed the Salt Lake & Utah Railroad Company to build an electric interurban line between Salt Lake City and Provo, and Walter C. Orem was named its president. Completed in 1914, it began regular service on July 24th of 1914. 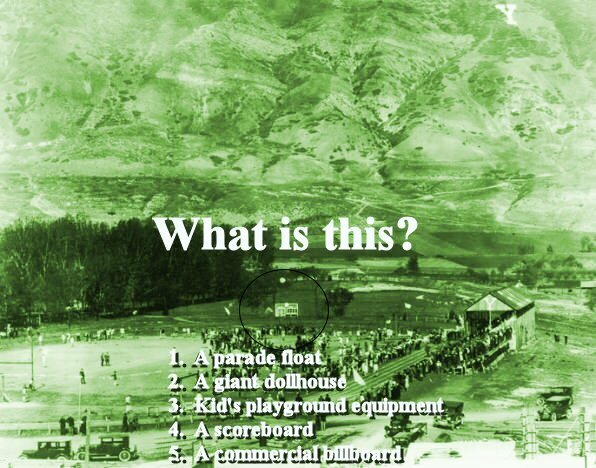 It became known as the "Orem Line." 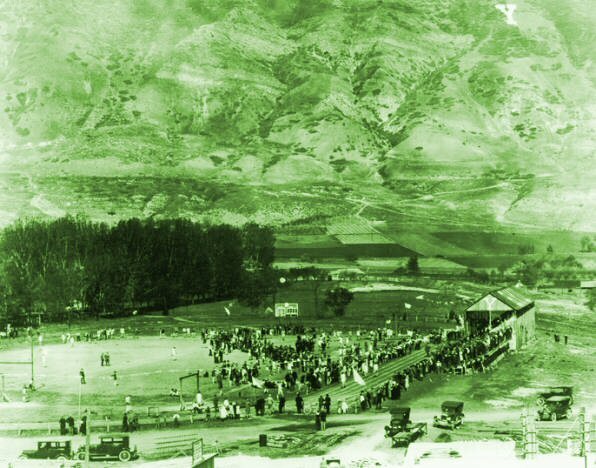 The "Provo Bench" was renamed "Orem" in 1919, in an attempt to attract investments from SLC's wealthy Orem family. Two of ten U.S. adults couldn't read or write. In 2005, Utah has the highest literacy rate in the nation. Only 7 percent of all Americans had graduated high school. According to one pharmacist, "Heroin clears the complexion, gives buoyancy to the mind, regulates the stomach and bowels, and is, in fact, a perfect guardian of health." There were only about 276 reported murders in the entire U.S. The Provo City Library was officially founded in 1905, with the goal of obtaining Carnegie funding. Prior to 1905 there were efforts to establish library service in Provo. In 1854 there was a collection of 120 volumes for community use. By 1870 the Provo City Library and Reading Room Association was founded only to dissolve about two years later. In 1876 the small collection became available on the library shelves of the Brigham Young Academy. In 1905, Strawberry Valley Water Users Association incorporated to build a reservoir in Wasatch County. A 3-mile-long tunnel through the Wasatch Mountains, started in 1906 and finished in 1913, would bring water from the 175-square-mile Strawberry reservoir, completed in 1915, to irrigate Utah County farms. And you reached this information with one keystroke. 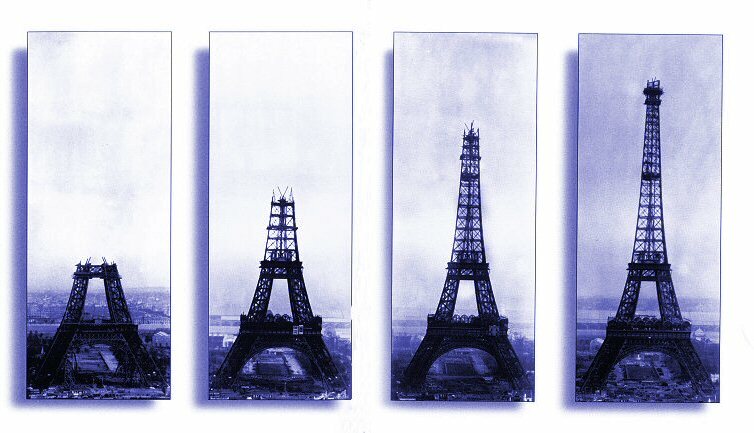 Try to imagine what things may be like after another century . . .